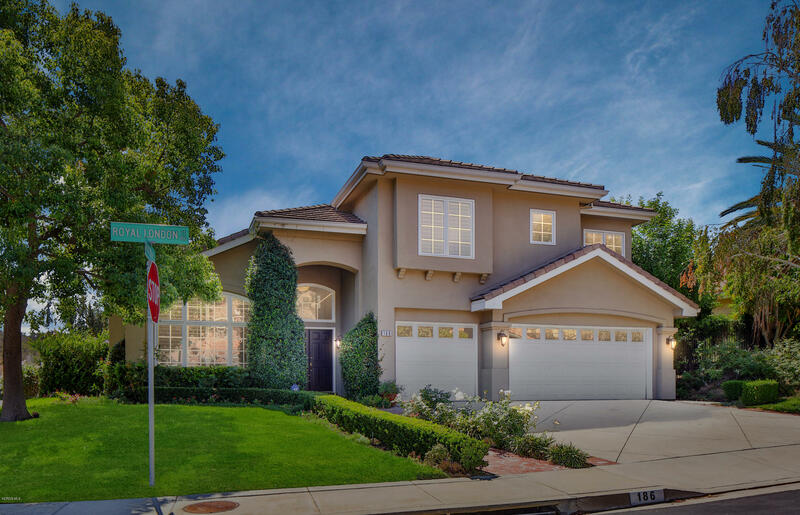 Welcome to the Meadows, a gated community in Lake Sherwood. You are greeted by warm colors, rich wood flooring and an open floorplan accented by two story ceilings. The elegant formal living room has a custom mantled fireplace with Travertine and opens to the formal dining room with plenty of room for a dinner party or family get together. Past the grand staircase is the kitchen with all white cabinetry, center island, granite countertops, walk-in pantry, breakfast bar & cozy breakfast area followed by the comfortable family room with fireplace and upgraded built-ins and one bedroom completing the first floor. Upstairs you'll find the master suite with cozy sitting area, fireplace, walk-in closet & spa-like travertine bathroom plus the remaining three bedrooms one en-suite and two with a Jack and Jill bath. The backyard is ready for kids or entertaining with a lovely covered patio, firepit, surround sound and a pebble tech brick ribboned pool & spa all in a private and serene setting.There are plantation shutters, crown molding and surround sound throughout rounding out this great property. Enjoy the resort lifestyle with access to Lake Sherwood and the community docks.